Start with optional helm and companion flip-up bolster-style seating for comfortable operation while sitting or standing. And check out the expansive helm area for mounting multiple large screens for fish finding accuracy. Aft of the helm in the seat base is a 52-gallon lighted, recirculating livewell just opposite of the transom mounted rigging station with removable tackle drawers, cutting surface and molded tool holders. 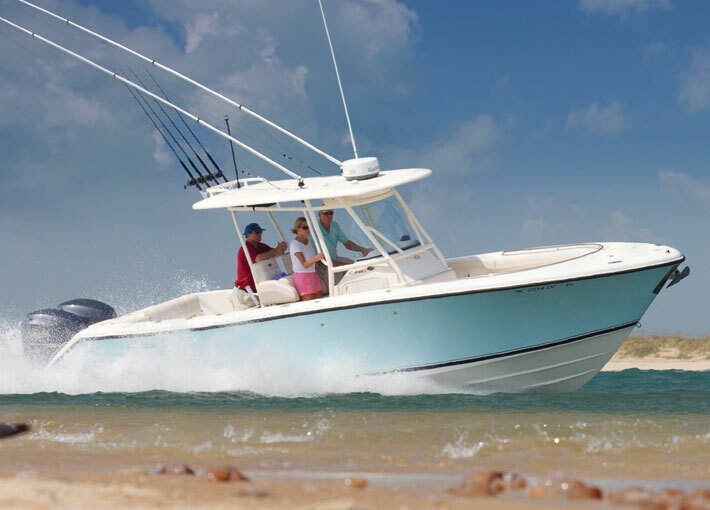 Passengers will appreciate the comfortable and convenient folding stern seat that quickly folds flush to the transom when the fishing begins. The two 29-gallon in-deck fishboxes with macerators are insulated to make your ice last longer so your catch stays fresher. There’s an additional 45-gallon insulated fishbox in the transom. The molded-in split bow and companion seating affords additional seating as well as unobstructed bow access for anchoring, docking or casting.